Amaterra’s $2000 grant to Native Seeds/SEARCH Conservation Farm for improving and building new infrastructure will help take their seed conservation mission to a new level. To meet a critical infrastructure need of expansion and growth, a green house is being constructed for the production of crop seedlings and food crops. The seedlings will be sold in the NS/S Retail Store for our Spring, Monsoon, and Fall plant sales. The retail store sells seedlings from several growers in Arizona. Seedlings from the Conservation Farm will introduce new crops from the seed bank and make them more widely available to gardeners, thereby increasing the diversity of adapted and drought tolerant crops for local food production. Food produced in the green house will be sold to restaurants to promote the mission of NS/S to the public. The sale of the plant seedlings and produce from the green house will also provide a reliable income stream for the Conservation Farm each year. 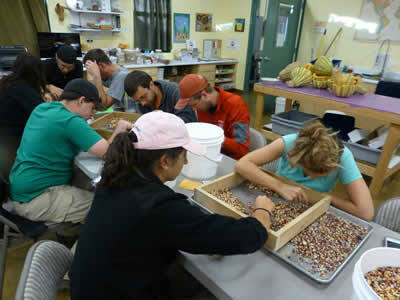 Program’s grow-outs of crops from the NS/S seed bank. A new seedling house with phytosanitary protocols ensuring disease-free seedlings is, therefore, critical. Some seedlings are grown from seeds that are endangered so there is a need to ensure that the seeds can be multiplied from healthy plants. The green house also provides a season extension function so that crops that may need a longer growing season than the Patagonia site normally provides, have an improved chance of producing seed in the field. In addition to the season extension function, the green house will provide climate mitigation for seed crops and for food production. This is an ever more important function in this time of changing and extreme climate. The unheated hoop house type of greenhouse will use only solar energy and ventilation to control the conditions inside the structure. This type of inexpensive, energy efficient, structure is widely used in agriculture today. These efficiencies are transferable to a wide geographic area, urban areas, and to different scales of food production.